The dispute at the city centre bakery looks set to escalate after promised talks failed to materialise. WORKERS OCCUPYING THE Paris Bakery in Dublin are considering a direct appeal to Minister for Social Protection Joan Burton after the collapse of talks with the owner. It is thought that the workers could now ask Burton to fast-track their application for payment through the state’s insolvency fund. The two parties had been scheduled to take part in negotiations with the owners this afternoon, but it is understood that this will not happen with the owners unlikely to keep to the plan. Earlier TheJournal.ie reported that the Revenue Commissioners last year demanded €200,000 from the Paris Bakery in outstanding taxes. It is thought that efforts by the workers to contact the owners proved fruitless. 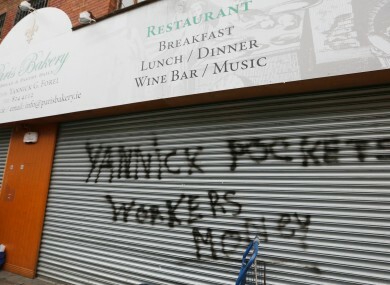 The workers have been occupying the company’s former premises on Dublin’s Moore street since last week, demanding the payment of €55,000 they say is due to them. They are refusing to allow the removal of equipment from the shop. A spokesperson for the Migrant Rights Centre of Ireland said that people in the shop are “in good spirits”. The Paris Bakery workers are understood to be holding a meeting to discuss the best way to proceed. In addition to the option of appealing to Burton, the workers are thought to be considering an escalation of the action against the owners or bringing a case to the Employment Appeals Tribunal. The potential for a High Court action against the owners is also being discussed. The group of 15 former employees travelled to the home of the owners of the business yesterday in an attempt to start a dialogue with the pair. It had been reported that the owners were due to meet with the workers today, but with the appointed time looming that now looks unlikely. Efforts to contact the owners of the Paris Bakery were unsuccessful. Email “Workers consider appeal to Burton after Paris Bakery talks non-starter”. Feedback on “Workers consider appeal to Burton after Paris Bakery talks non-starter”.